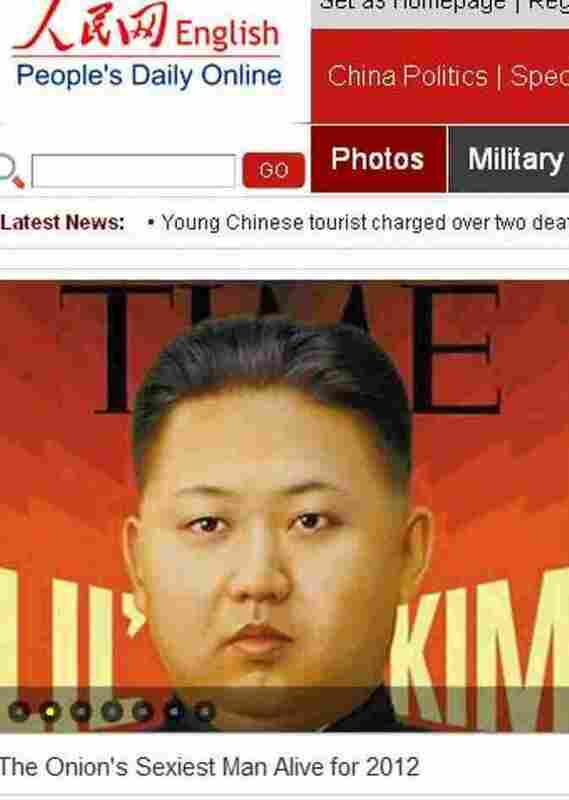 OK, North Korea's Leader Isn't 'Sexiest Man Alive,' Chinese Media Concede : The Two-Way China's Web surfers have had much fun at the expense of People's Daily Online after it accepted as fact that The Onion thinks Kim Jong Un is 2012's biggest hunk. Editors at the Communist Party's mouthpiece now realize they were punk'd. China's Web surfers have had a lot to say about how People's Daily Online — the internet version of the Communist Party's mouthpiece — got fooled into republishing a "story" by The Onion that declared North Korean dictator Kim Jong Un is 2012"s "sexiest man alive." On China's increasingly free-wheeling internet, thousands of users have ripped the state-run news site for falling for the joke. Before it disappeared from the Web: Here's how People's Daily Online packaged its coverage of the "news" that Kim Jong Un is 2012's sexiest man. "With such a low IQ, how can we expect People's Daily to represent the People?" one person wrote on Sina Weibo, China's most popular, Twitter-like site. "Actually, People's Daily and The Onion are the same," wrote another. It didn't help that People's Daily Online improved on the fake story by adding a real, 55-image, photo gallery of the cherubic dictator, including one of him appearing rakish on horseback. But if you want to see the People's Daily's version for yourself, sadly, you can't anymore. People's Daily took the story down Wednesday morning. "We have realized it is satirical," an editor who works on the site's South Korea channel told The Associated Press. The Onion, naturally, had nothing but praise for the People's Daily Online. "We are pleased that one of our many fine Communist subsidiaries, the People's Daily in China, has received accolades for its coverage of our Sexiest Man Alive announcement," Onion editor Will Tracy says, with tongue firmly planted in his cheek, in a statement sent to news outlets. "The People's Daily has served as one of the Onion's Far East bureaus for quite some time, and I believe their reportage as of late has been uncommonly fine, as well as politically astute. May our felicitous business association continue for centuries to come."